Fiji's Cema Nasau (middle) at the OFC U-19 Women's Championship 2017. After finding the net in four of Fiji’s five games at the OFC U-17 Women’s Championship in 2016, Cema Nasau is already back on Oceania’s scoresheet, finding the net twice in Fiji’s 4-0 win over Tonga in their opening match of the OFC U-19 Women’s Championship 2017 on Tuesday. A shy 17-year-old when she’s not wearing her boots, Nasau’s competitive nature came out in full force when she took the field for her country at Ngahue Reserve in Auckland. The young midfielder opened scoring for Fiji in the 30th minute of the game when her shooting skills were called to action at the penalty spot following a Tonga handball. After two more goals from captain Luisa Tamanitoakula, a 65th minute screamer from Nasau secured the win – and a crucial three points for Fiji. Although scoring for her country is no new experience for the young midfielder, Nasau was overwhelmed with pride following the promising win. “I feel very proud about my goals because this is such a big competition and the teams are very good,” she said. Although Nasau only discovered her passion for football two years ago, her experience at the U-17 Championship and development with Fiji club Ba F.C. has the midfielder feeling confident about her second ever OFC campaign. “I think I’ve made a big improvement from last year,” she said. “I learned a lot in the U-17s and I came to the U-19s with more experience and I’ve improved in my position. Nasau credits her improvement on the field to Fiji coach Saroj Kumar and the growing opportunities for female footballers at both national and club level in Fiji. “Saroj Kumar is a good coach. He has taught us a lot of things that we didn’t know and he makes the trainings fun,” she said. 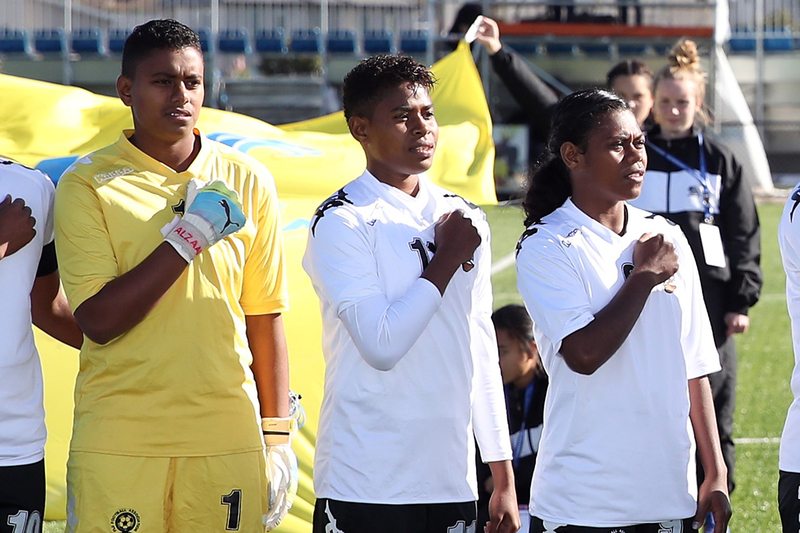 The big dream for Nasau is to reach the Fiji senior national women’s team, but for now her focus is on today’s clash against defending champions and competition favourites New Zealand. “I think New Zealand will be the hardest team to play because last year in the U-17 championship they were a hard game. We need to beat New Zealand,” she said. Fiji will play New Zealand in the second match day of the OFC U-19 Women’s Championship at Ngahue Reserve in Auckland, New Zealand, today at 10am (local time).